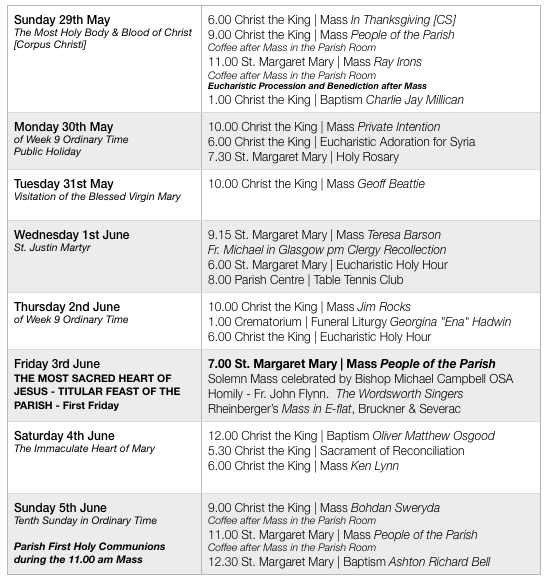 This year the Solemnity of the Sacred Heart of Jesus falls on Friday 3rd June. As has become a tradition in the parish we will celebrate with a ‘Posh’ Mass in the evening at 7.00 pm. The Wordsworth Singers will be joining us again this year and Bishop Michael Campbell will be the celebrant. The Mass will be followed by a buffet and social in the Parish Centre. Please make a note in your diary of this and invite friends and family to come along. AS A ‘WORK OF CORPORAL MERCY’ AS PART OF THE FEAST PLEASE ‘FEED THE HUNGRY’ BY CONTRIBUTING ITEMS FOR THE ST. MARGARET MARY SVP FOOD COLLECTION WHEN YOU COME ALONG ON FRIDAY EVENING. Will be celebrated in the parish during the 11.00 am Mass at St. Margaret Mary. Please pray for all the children involved and grateful thanks to all who helped prepare the children to receive our Lord in Holy Communion for the first time. The Diocese are renewing the registration of all parish volunteers across the diocese over the coming months. For those involved in taking Holy Communion to the sick, in children’s liturgy of the Word and adults who work with altar servers at St. Margaret Mary, please make themselves available on either the 7th or 17th June at 7.30 pm at St. Margaret Mary’s Primary School for the renewing of their DIB. See James for more details or if you can’t attend on either of those evenings. Knights of St. Columba - go camping! Parishioners are invited to a Catholic Camping Festival between 1st-3rd July at High Wray Bank on the shores of Lake Windermere. £20 a pitch camping, vans and caravans. For more info, please contact Paul on 07788818535 or visit www.ksccampingfestival.co.uk. Book early to avoid disappointment. Thank you for your response to the Fashion Show - this event is now SOLD OUT. 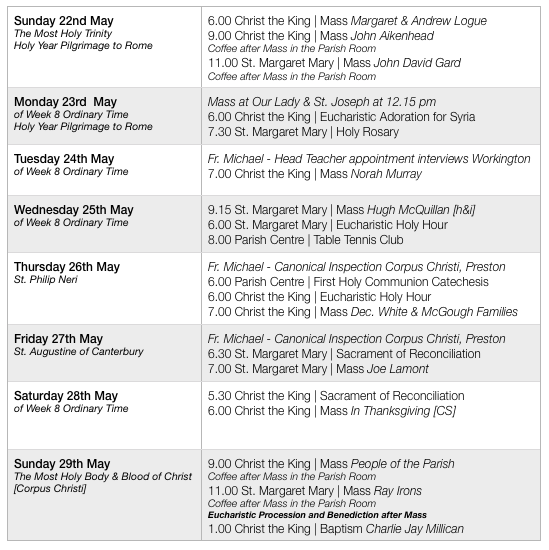 Bishop Michael Campbell will return to the parish on the weekend of the 11th - 13th June for the Episcopal Visitation of the Parish [the church equivalent of an Ofsted]. He is eager to meet parishioners - there will a shared lunch on Sunday 12th June in the Parish Centre from 12.00 noon. Lists will appear shortly for offers of food. Please come along to this to show the vitality and diversity within our parish. A new Catholic Truth Society display has been bought for the parish and can be found at Christ the King. It provides resources for personal faith development and to deepen personal prayer. A range of titles are available for purchase and will be restocked throughout the year. Place monies in the box nearby in the slot marked CTS. Please continue to support this worthy initiative via the basket in the porch at Christ the King. We have been asked by Carlisle Food Bank if we can particularly supply UHT Milk, Rice Pudding, Custard, Tinned Fruit, Pasta Sauce. There is a basket in the porch for items at Christ the King. Sr Gerald & Sr Maureen invite you to join them each week to pray for a change of heart for the people of violence in Syria and for their victims. Mondays 6.00-7.00 pm. 40 parishioners are currently making a Holy Year Pilgrimage to Rome. Today they attend Mass at the Venerable English College. Fr. Michael will be offering Mass for the intentions of parishioners. Our diocesan residential youth centre, Castlerigg Manor, Keswick, invites you to join in their Family Weekend: 27-29 May. Cost: £75 adult, £50 child. For more information, visit www.castleriggmanor.co.uk, e-mail team@castleriggmanor.co.uk or phone the team on 017687-72711. Come and be refreshed in the Living Water - A day for women to experience the renewing love of God. Saturday 11th June 2016 Cor et Lumen Christi, Wigton, CA7 9HU - DONATION ONLY EVENT. To book or for more information: Web: www.coretlumenchristi.org / Email: stcuthberts@coretlumenchristi.org / Tel: 016973 45623. A family-friendly party celebrating the "Joy of Love" on 17th of June at 5.30 - 7.00 pm in the Parish Centre, Scalegate Road. There will be a disco, ceilidh dance, treasure hunt and outdoor games. Please bring your favourite party food to share and lots of Joy. More details on the leaflets available in church. A holiday and study week, 25 June-2 July, Boarbank Hall. 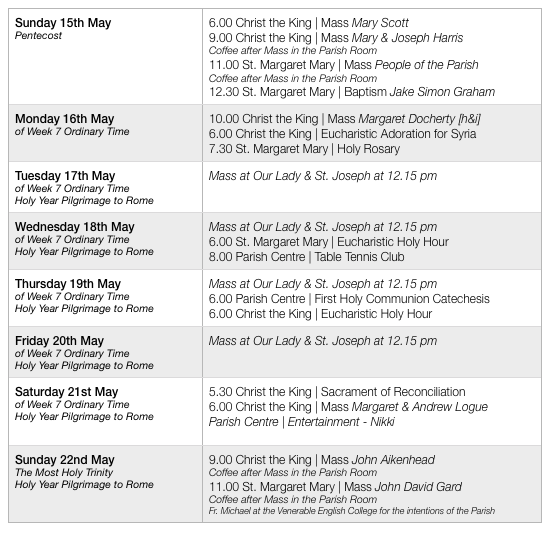 A chance to study St John’s Gospel as literature, as history, as theology…. through lectures, reading and discussion. Email: margaret@boarbankhall.org.uk / Web: www.boarbankhall.org.uk. Is God calling you to be a priest? For men aged 20+ between 10th and 12th June in Hawkshead. To book a place or for more information, please contact Fr. Darren on 01772 719604. All are welcome to take part in the various events happening during the week of Parish Mission at OL&SJ, 10-16 July: daily spiritual conference after the 12.10 pm Mass; Sermon & Benediction, 7.00 pm; opportunities for Confession. This year the Solemnity of the Sacred Heart of Jesus falls on Friday 3rd June. As has become a tradition in the parish, we will celebrate with a ‘Posh’ Mass in the evening at 7.00 pm. The Wordsworth Singers will be joining us again this year and Bishop Michael Campbell will be the celebrant. The Mass will be followed by a buffet and social in the Parish Centre. Please make a note in your diary of this and invite friends and family to come along. First Holy Communion will be celebrated during the 11.00 am Mass on Sunday 5th June. Our ‘Friends of the Sacred Heart Parish’ have organised a professional fashion show, to be held on Wednesday the 15th June at 7-30 pm in the Parish Centre, Scalegate Road. Tickets are £5 each and a fabulous charity raffle will be held on the night. For tickets and information, please contact Elisabeth Lovell on 01228 542307 or Alison Hather on 07711391049. See poster for more details. During the Month of May, the Holy Rosary will be prayed after the celebration of the weekday Mass: the general intention will be to pray for the people who live in our parish, a successful celebration of our parish feast day and for a successful visitation. The next date is Saturday May 28th. Our speaker will be Niklas Carlsson from Cor et lumen Christi. To be held at St Edmund’s Church, Orton Rd, Carlisle. All welcome. Renewal days start at 11.00 am and finish around 4.00 pm. Please join us even if you cannot stay for the full day. Tea and coffee will be provided. Please bring a contribution to a shared lunch. For further information, please contact Janice Wrench – 01768 868489. If you are a tax payer - please consider joining the Gift Aid scheme - it makes your weekly contribution go a lot further. We are able to pay our annual gas and electricity bills [which are high as you can imagine] with the extra income we receive from the Gift Aid scheme. Forms are available from Paul at Christ the King and Richard at St. Margaret Mary. Come and be refreshed in the Living Water - A day for women to experience the renewing love of God. Saturday 11th June 2016 Cor et Lumen Christi, Wigton, CA7 9HU - DONATION ONLY EVENT. To book or for more information: Web: www.coretlumenchristi.org Email: stcuthberts@coretlumenchristi.org Tel: 016973 45623. We welcome back Fr. Norman Johnston, who, thanks to Divine Providence [and Everton losing the FA Cup semi-final] will by supplying Masses for the parish this weekend. 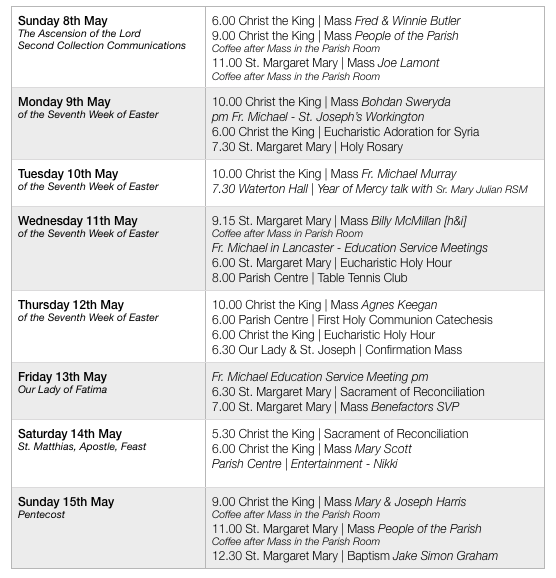 Please note the time of Mass on Thursday this week. Fr. Michael is inspecting a secondary school in Preston during the day so Mass will be celebrated in the evening - he felt 5.00 am Mass would be a tad early! A holiday and study week, 25 June-2 July, Boarbank Hall. A chance to study St John’s Gospel as literature, as history, as theology,….through lectures, reading, and discussion. An opportunity for daily prayer and liturgy with a Community. Time to think about your faith. To be part of a small, friendly group. To share home-made meals. Freedom to explore the Cumbrian countryside. See the flyers. To book a place, please contact Sr Margaret Atkins on 01539 532288, margaret@boarbankhall.org.uk or visit www.boarbankhall.org.uk. Our ‘Friends of the Sacred Heart Parish’ have organised a professional fashion show, to be held on Wednesday the 15th June at 7.30 pm in the Parish Centre Scalegate Road. Tickets £5 each and a fabulous charity raffle to be held on the night. For tickets and information, please contact Elisabeth Lovell 01228 542307 or Alison Hather 07711391049. See poster for more details. Last weekend attendance was 69 + 73 + 107= 249. The offering was 464.75 + 231.44 = £696.19. Thank you for your generosity. Congratulations to Jemma Scott, Rafael Redoble, Jeremy Pangan, Josh Metcalfe and Romar Rapacon - young parishioners who were Confirmed by Bishop Campbell on Thursday evening at Our Lady’s. 40 parishioners will be travelling on Tuesday to make a Holy Year Pilgrimage to Rome. On Wednesday they will attend the General Audience with the Holy Father, on Thursday travel to Assisi for Mass near the tomb of St. Francis, on Friday they will pass through the Holy Door of St. Peters and on Saturday morning will celebrate Mass in the Hungarian Chapel of St. Peter’s Basilica. Next Sunday they will attend Mass at the Venerable English College. If you have any particular intentions you wish us to bring to Rome - please pass on to Fr. Michael before Monday evening. The next date is Saturday May 28th. Our speaker will be Niklas Carlsson from Cor et lumen Christi. To be held at St Edmund’s Church, Orton Rd, Carlisle. All welcome. Renewal days start at 11.00 am and finish around 4.00 pm. Please join us even if you cannot stay for the full day. Tea and coffee provided. Please bring a contribution to a shared lunch. Contact Janice Wrench – 01768 868489. I would like to express my thanks to Paul Daly and Richard Reardon for their efficient work behind the scenes with our parish Gift Aid application. Like much in the parish - a lot of tasks go unnoticed by many but the parish would not function without such help. If you are a taxpayer - please consider joining the Gift Aid scheme - it makes your weekly contribution go a lot further. We are able to pay our annual gas and electricity bills [which are high as you can imagine] with the extra income we receive from the Gift Aid scheme. Forms are available at the back of church. Web: www.coretlumenchristi.org Email: stcuthberts@coretlumenchristi.org Tel: 016973 45623. We welcome back Fr. Norman Johnston who, thanks to Divine Providence [and Everton losing the FA Cup semi-final], will be supplying Masses for the parish next weekend. Our ‘Friends of the Sacred Heart Parish’ have organised a professional fashion show, to be held on Wednesday the 15th June at 7.30 pm in the Parish Centre, Scalegate Road. Tickets are £5 each and a fabulous charity raffle will be held on the night. For tickets and information, please contact Elisabeth Lovell 01228 542307 or Alison Hather 07711391049. See poster for more details. Bishop Campbell will celebrate the sacrament of confirmation for a number of young parishioners at Our Lady and St. Joseph’s on Thursday 12th May at 6.30 pm. Parishioners are invited to come along to support our young people - keep them in your prayers. Last weekend attendance was 53 + 73 + 104 = 230. The offering was 455.60 + 274.55 = £730.15. Thank you for your generosity. Sr Gerald & Sr Maureen invite you to join them each week to pray for a change of heart for the people of violence in Syria and for their victims. Mondays, 6.00-7.00 pm. Faith in the new economics? Are we stuck with politics, finance and economics as we know them? Are there alternatives? How does all this relate to our fundamental beliefs and values? Sr Margaret Atkins, Boarbank Hall, will chair a day hosted by our diocesan Faith & Justice Commission on Saturday 14 May, from 10.00 am - 4.30 pm @ Holy Trinity & St George parish centre, Kendal LA9 4BW. All welcome. To register, please e-mail: lfjc@talktalk.net or phone 01524-383081. This takes place on Saturday 18th June at Liverpool Metropolitan Cathedral. The cost is£10.00 per person (meals at your own expense). The Knights of St Columba in Carlisle are organising a coach to attend this event. of your name and phone number by MONDAY 9th MAY 2106. Recovering age-old traditions that guide men through manhood. Trusting that something much greater is at work in your life than you could imagine. Taking you sometimes out of your comfort zones, yet more deeply into your own life. For young men (18-28), 7-11 July, Northumberland. www.ymrop.org.uk. For men of all ages, 20-14 July, Perthshire. www.mrop.org.uk. Pope Francis calls us during this Year of Mercy to focus prayerfully on three main aspects: recognising God’s mercy, receiving God’s mercy and becoming more merciful ourselves. Sister Mary Julian RSM will reflect on principles and practicalities for The Year of Mercy by looking at the “Beatitudes”. Tuesday 10 May, 7.00 pm, Waterton Hall: Blessed are those who hunger and thirst for what is right.